“Everyone can offer blessings every day — perhaps not as eloquently as the author of this book, but with the same intention. Try to bless the author: that should not be difficult. Then try blessing your partners, your friends, your acquaintances, and then your competitors and your enemies. Going that far will be difficult — more and more difficult. But it should not be impossible. And it would be important. If your example would catch on and help create a sort of blessing-epidemic in the world, the effort would pay off. It would realize not only the intention of the author of this book, but the intention of well-thinking and ethical people everywhere Realizing that intention could be our best hope for the future — perhaps our only realistic hope. There are many reasons to bless. We bless to help heal society. We bless to get out of the shell or cave of our little egos and open up to the world. We bless as a wonderful way of practicing mindfulness and staying present to the present – anywhere. We bless because it is a highly efficient way of solving relationship problems and personal challenges Blessing isn’t associated with any religious denominations. I do not believe there is any “right” way of blessing. The intention and sincerity of the heart are infinitely more important than any so-called correct way of giving a blessing, and any formulas or rigid forms in this field are a direct route to failure. A blessing that is just on the level of the mind has no healing power whatsoever. One can never stress too much that blessing is one hundred percent heart energy. To heal, I believe it has to be felt in the heart. Ultimately, however, I personally see blessing as an expression of growing in love, which I believe is our ultimate reason for being here. Blessing is a way of sending unconditional love, peace, healing, goodness to a person or a situation, or simply seeing them bathed in that love. It is becoming more and more apparent to a growing number of us on this planet that the material world we live in is, in some manner, a total dream (even though it can often be a nightmare!) and that we are here on earth to learn much-needed lessons (that we ourselves possibly chose before coming on earth). Many research studies have shown (Larry Dossey, MD, Dr. Joe Dispenza, Dean Radin at the Institute Noetic Sciences, Dr. Masaru Emoto, Dr. Bruce Lipton, and others) that loving, healing thoughts, and that includes blessing, have an immense healing potential, not only on the individual level, but also for the world, hence the title of my book. I believe with many others that the number one issue, challenge and need in the world today is raising world consciousness, because the solution of every single problem ultimately depends on that. Today, I bless myself in my ability to see the true spiritual reality behind the veil of material appearances. - When I behold the beauty of a flower, I will see divine Love smiling at me. - When I see a flock of sheep, I will remember that the divine Shepherd, infinite Love, is constantly guiding me and all. - When I see my neighbor, I will remember that I am looking at myself in disguise, and joyfully bless what I see from the deepest wellspring of my soul. - When I look at the sun, I will rejoice in the reminder that I am the light of the world, as a great spiritual teacher taught 2,000 years ago. - When I look at a loaf of bread at the baker’s or fruit at the supermarket, this will be a reminder that I live not by bread alone but also of what the Spirit whispers to me in the secret of my heart. Am I listening? - When I see a person in tears or deeply afflicted by some woe, I will silently bless them in the divine joy that waits in their heart to spring forth and lift their pain. - and when I pass a hospital, I will bless its patients in the fullness of their health that awaits in them to be discovered. - Finally, when I pass a mirror I will exceedingly rejoice in and joyfully bless the daughter or son of infinite divine Love I behold there. A true world citizen, Pierre Pradervand has labored a great deal of his life for social justice, living in or visiting 40 countries on every continent. From his Geneva home Pierre is now active as a writer, speaker and workshop facilitator, helping people to live simpler, yet richer, more contented lives. Pierre is the author of international bestseller The Gentle Art of Blessing. 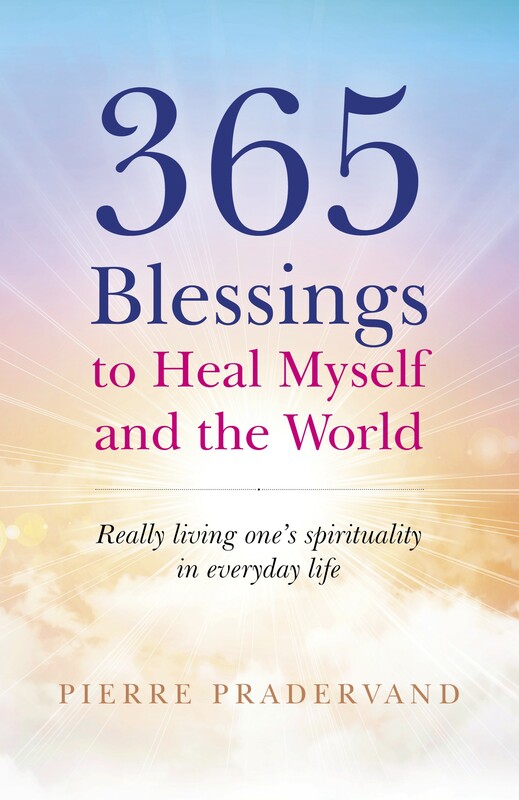 365 Blessings to Heal Myself and the World, by Pierre Pradervand is published by O Books 29th June 2018. ISBN: 978-1-78535-729-9 (Paperback) £14.99 $23.95.